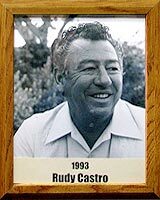 At Tucson High Scholl (1946-49), Rudy Castro played football, baseball and basketball, and was named all-state captain of the undefeated basketball “Badgers” team that went on to win 52 straight games. He kept that winning attitude as first-string shortstop for Frank Sancet at the University of Arizona (1959-56), and went to Omaha for the World Series three years’ running. He also hit the court for basketball coach Fred Enke for two years. Rudy next played baseball and basketball for the Camp Pendleton Marines and won All-Marine honors as an outstanding shortstop in 1951. He also played pro ball (C) with the Tucson Cowboys and Phoenix Senators of the Arizona Texas League. Next came 14 years of coaching at Safford and Roskruge Junior High Schools with championships in baseball and basketball. Castro has also officiated football, basketball and baseball for many years, including a U of A vs. ASU series; and has earned gold, silver and bronze medals for baseball in the senior Olympics. Rudy, a life long Tucsonan has played with many baseball and softball teams around Tucson.